Although Ghana has an extensive system of public hospitals and clinics, and has introduced a national health insurance scheme, access to quality health care is not universal or free. Only the most basic services are free, and the quality of care is uneven and inconsistent. Many Ghanaians, especially in rural areas, effectively have no access to modern health care. Instead they often rely on traditional herbalism, which is fine for many acute or chronic health conditions, but not for all. There are no statistics available on the health status of the people of Dagbamete; but malaria, diarrhea, diabetes, high blood pressure, cataracts and physical deformities are common. Several premature deaths due to undiagnosed or misdiagnosed conditions have occurred in recent years. The nearest hospital is in Abor, about 4 km away. The mission hospital is perceived by the villagers to be discriminatory against the residents of Dagbamete, most of whom are not Christian. Villagers prefer not to go there unless there is no other option. Instead they prefer to go to a hospital in Akatsi, about 14 km away via the road to Adrakpo. But the Akatsi hospitals are chronically understaffed, so villagers who can afford the high cost will go to a modern hospital in Aflao or Accra. Faced with these choices, many villagers choose not to go the a hospital unless their condition is dire. The concepts of regular checkups and early diagnosis and treatment is unfamiliar to them, and deaths due to preventable serious diseases are not uncommon. Recognizing that adequate access to quality health care in the village is essential, the elders decided to establish a medical centre staffed with qualified nurses and doctors. Without government assistance, the village erected a building in 2014 on land provided by the village to serve as the clinic and laboratory. The village also built separate living quarters for the nurses and doctors. The village has applied to the Ghana Ministry of Health for registration, and is waiting for approval to operate as a fully qualified medical facility. In the meantime the village is acquiring the equipment and supplies needed to become fully operational. Already the medical centre is staffed with nurses who are providing basic medical services for the village. 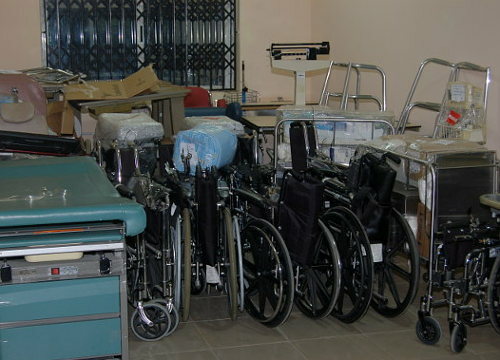 So far the medical centre has received a variety of donated medical equipment from the U.K. and Canada, including blood pressure monitors, examination tables, beds, wheel chairs, as well as an array of medical supplies. More equipment is needed and donations of good new or used equipment are always welcome. The village is considering running the medical centre as a private entity and is interested in talking to any qualified medical officers about partnering with the village to that end. Expressions of interest should be directed to Mr. Sammy Davor at sammydavor22@yahoo.com. Currently, the Dagbamete Medical Centre has six nurses: a registered nurse, a community health nurse, and four community health workers. The enrolled nurse conducts patient consultations, treats minor illnesses, dresses wounds, and educates patients. The community health nurse provides family planning and counselling, and makes home visits. The community health workers are responsible for collection and recording of vital statistics, counselling, health education, home visits, and home-based care in the community.